Want Colin Fassnidge to Cook For You? Australia’s leading food rescue organisation, OzHarvest, is preparing a menu with a difference for their annual fundraiser, the CEO CookOff to be held on Monday, 25 March at Sydney’s Royal Hall of Industries. The unique charity event brings together over 200 of Australia’s industry leaders and corporate teams with 50 top chefs to create and serve a gourmet dinner made with love, hope, generosity and new this year, six versions of the humble trifle made by a team of world famous dessert chefs. More than 1,400 special guests from charity agencies across Sydney will enjoy the gastronomical delights prepared by the likes of Matt Moran, Neil Perry AM, Guillaume Brahimi (Bistro Guillaume), Jacqui Challinor (Nomad), Manu Feildel (My Kitchen Rules) and Rob Cockerill (Bennelong). His Excellency General the Honourable David Hurley AC DSC (Ret'd), Governor of New South Wales and Mrs Hurley will join the kitchen action and guests will be entertained by a live performance from Aussie legend Daryl Braithwaite. In addition to fuelling food rescue operations around the country, a long-standing partnership with BP ensures OzHarvest can bring this annual event to life. BP President Andy Holmes is handing over the spatula to Tanya Ghosn, General Manager Castrol ANZ, who will be cooking up a storm in the kitchen on the night. “This is our third year supporting this special event and, once again, the whole team across our BP and Castrol brands are energised to make a difference in the lives of those Australians who need it most. In 2019, as BP celebrates 100 years of operations in Australia, we are incredibly proud to continue our support of OzHarvest and their mission to Nourish our Country,” said Andy. Attending the event for the first time is Mum of seven, Rikki from Lomandra School in Campbelltown, where she receives OzHarvest food regularly. “I’ve never been to anything like this before. Just to eat a meal without sharing with my kids and have a night out with my husband alone is something I haven’t done in a very long time. I couldn’t get by without the food OzHarvest delivers to Lomandra, fresh fruit and veg just wouldn’t be a part of my kids diet as it’s so expensive,” said Rikki. Tabcorp Holdings and their CEO Adam Rytenskild are topping both fundraising leader boards with over $125,000 raised so far. Adam is closely followed by Adrian Coseneza from the Australian Orthopaedic Association, Peter Andrews from Andrews Meats and Michael Schai from Lindt and Sprungli. 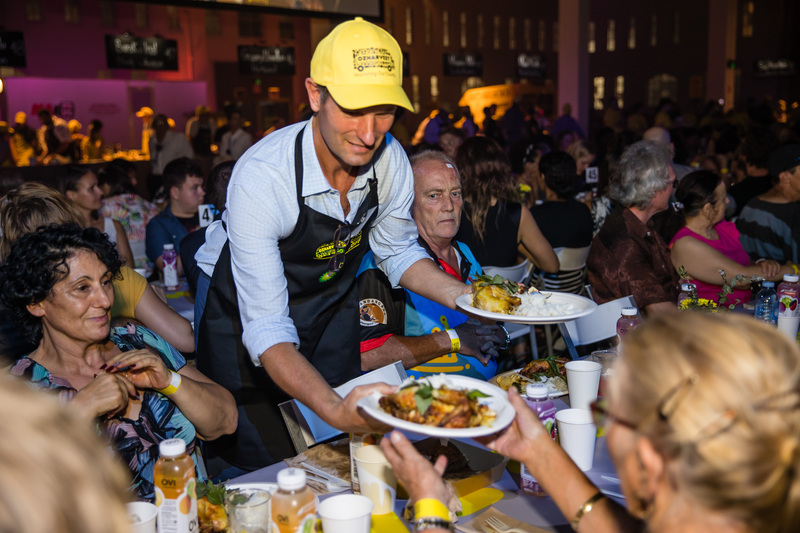 The dessert station is a new addition to this year’s CEO CookOff and was the brilliant idea of Colin Fassnidge, who has supported the event since the beginning. Six world-class dessert chefs will be creating their own take on the home-made trifle. The dessert station is sponsored by Lindt.